So, how’s that newsletter coming along? Home / Blog / Articles / So, how’s that newsletter coming along? We need to get our newsletter done. After all, we need to send something out to our customers or prospects — right? Let’s think differently about the good old newsletter or e-newsletter by considering three more intriguing options that will be easier to produce and possibly more effective as marketing tools, or as an extension to your current newsletter. Here’s a neat way (see image above) to talk about your products or services in an upbeat and aspirational way. 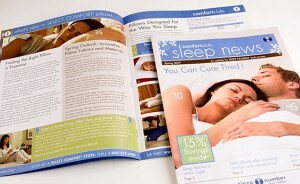 A magalog is really just a catalog-styled piece that offers a mix of current happenings and relevant content. It looks open and approachable and can be printed or delivered digitally. Hello Pinterest! Don’t forget about the ease and convenience of using a newsroom page as part of your Facebook business page or check out Pitch Engine which is a digital press release with multimedia options. Both these can allow for nice for distribution and fan-building opportunities. Often the best foundation for all your online content, a blog is instrumental in your online marketing. It’s a central distribution point for information you want to make available to customers, but it’s also a great SEO device for attracting new customers. The good news is you can easily integrate all these with your current newsletter and multiply your online marketing efforts. 3 Responses to So, how’s that newsletter coming along? Please add me to your newsletter list and future events notifications.Great idea and very important work! nice post! am searching forward to review your future post. I was reading some of your posts on this site and I believe this website is very instructive! Retain posting .